October 1987: the morning after the Great Storm. Fifteen-year-old Tania Mills walks out her front door and disappears. Twenty-seven years later her mother still prays for her return. 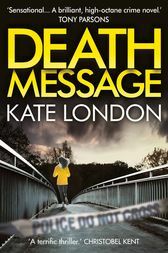 DS Sarah Collins in the Met's Homicide Command is determined to find out what happened, but is soon pulled into a shocking new case and must once again work with a troubled young police officer from her past, Lizzie Griffiths. PC Lizzie Griffiths, now a training detective, is working in the Domestic Violence Unit, known by cops as the 'murder prevention squad'. Called to an incident of domestic violence, she encounters a vicious, volatile man - and a woman too frightened to ask for help. Soon Lizzie finds herself drawn into the centre of the investigation as she fights to protect a mother and daughter in peril. As both cases unfold, Sarah and Lizzie must survive the dangerous territory where love and violence meet.